Holy water (Theertham) : Seven Theertham. Sacred Tree (Sthala Vriksham) : Kalvazhai – Plantain tree. Timings : 06:30 a.m. to 01:00 p.m. and from 04:00 p.m. to 08:00 p.m. This is the 61s sthalam on the northern side of river Cauvery. Moovar has sung hymns in praise of Lord Shiva of this temple. Tiruppainjeeli (pronounced as Tiruppainneeli) is a village located near Trichy in Tamil Nadu of South India. It has an important Hindu temple dedicated to Lord Shiva. 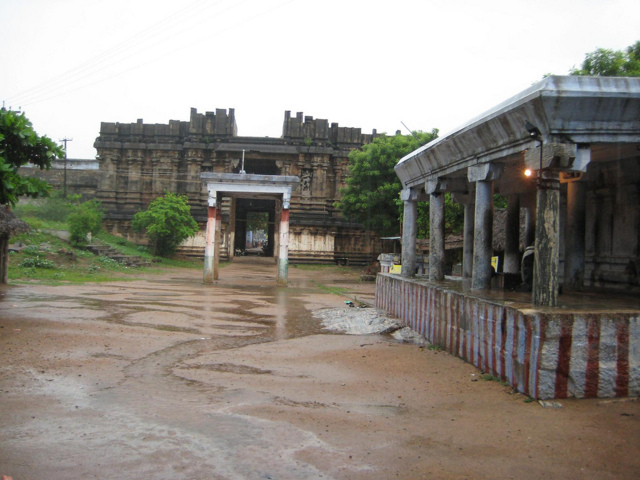 This temple is considered as the 61st site among the Tevara Paadal Petra Stalams (275 most important temples of Lord Shiva) located in Chola country north of Kaveri river. The Sastiyaptha Poorthy celebration are also conducted in this temple. Those who lost positions will get back the same if they do parikaram in the Yematharmaraja sannadhi, Since he got back his power after worshiping Lord Shiva of this temple, which he lost at Thirukkadaiyur. This is one of the parikara sthalam to remove obstacles for the marriage. In formal marriage rituals are conducted treating sthala viruksham injeeli Plantain Tree ( Kal Vazhai) as life partner. The temple tree's fruit should not be consumed by the human beings, instead it should be offered only to Lord Shiva. If Consumed it will create lot of problems in the body. Small sannadhis for Ambal, Vanathayee Amman, Then Kailayanathar, Sabtha Mathakkal, Gajalakshmi, Sri Valli Theivaanai sametha Sri Arumuga Kadavul, Sri Sentamaraikannan, Sri Thakshayini Ambika Sametha Imruthayanjar Yemathamaraja Sannadhi and Sorudaya Eswar. The temple and Yematharmaraja Sannadhi are 9 steps below the ground level. 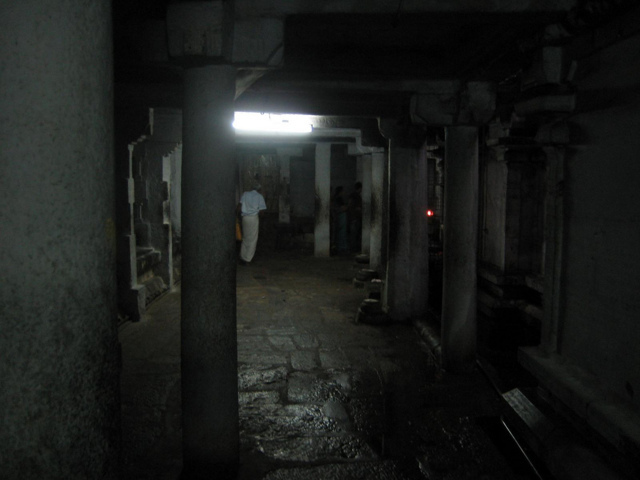 There is no Navagrahas, instead there are 9 holes ( “Kuzhi” on floor stone) in front of Nandhi is considered as Navagrahas and people light lamps in the holes. The architecturally beautiful unfinished tower is the highlight of the temple. The dwarapalaks' statues in the tower entrance are also very attractive. The area behind the tower is an open space with a small four-pillared mandapa and a small shrine of Lord Shiva. 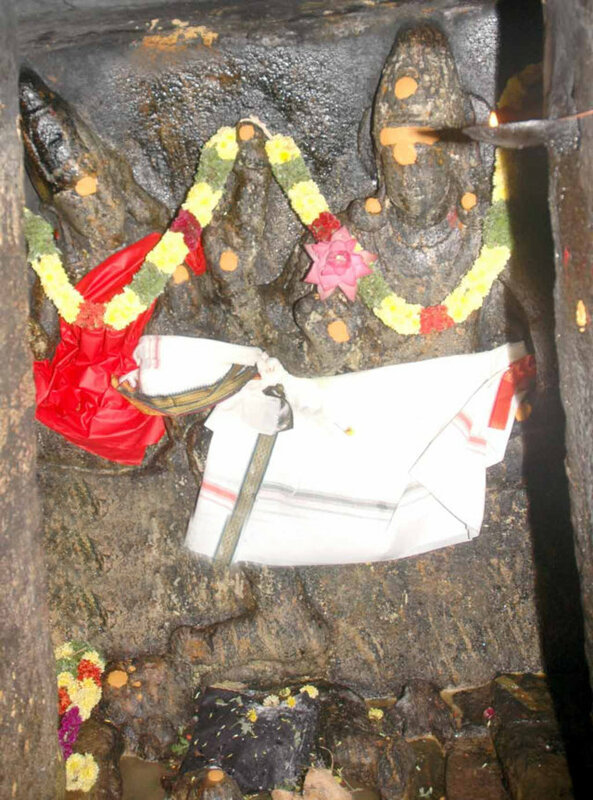 The Shiv Linga and the adjoining Nandi idol are located slightly underground. Shiva is named as Chottrudai Eswarar in this shrine. As per the legend, the saint Tirunavukkarasar suffered with hunger; Shiva took the form of a Brahmin and fed him in this place. There is another three tiered tower with a small shrine for Ganesha in the entrance. The tower is named as 'Ravanan Gopuram'. Outside the tower on the right side, there is a cave temple constructed by Pallavas (possibly during Mahendravarma Pallava's period in the 7th century AD). There, we can find a beautiful and rare bas-relief image of Somaskanda form. Shiva and Parvati are found in the sitting posture; especially Parvati is sitting stylishly with her left leg hanging down and right leg folded; Lord Skanda as an infant is found between them. Yama - the God of death, is found in the form of infant at the feet of Lord Shiva. People call this as Yama temple as it is rare to find a separate shrine for Yama. As per the legend, Lord Shiva killed Yama in order to protect his devotee Markandeya. Based on the request from the Devas, Shiva gave him re-birth in this site and hence he is found in the form of a infant. The temple does not have Navagrahas (nine planets). Instead, the small holes near the Nandi statue and the nine steps at the Ravanan tower represent the nine planets. 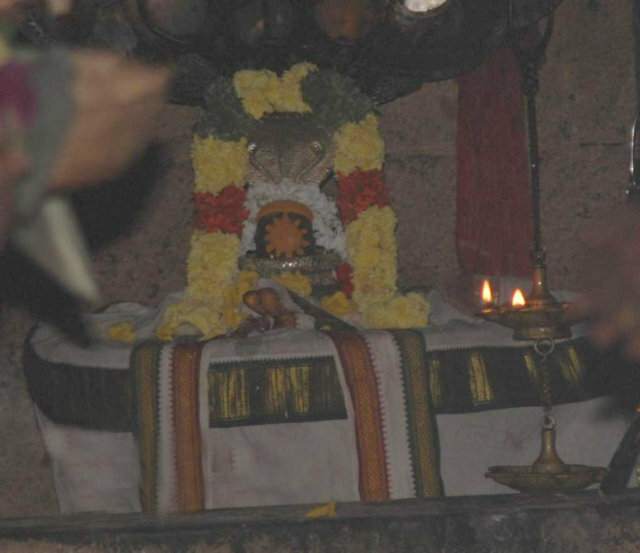 The sanctum sanctorum has a very small idol of Shiv Linga named as Neelivananathar. The wall around the sanctum sanctorum has Dakshinamurthy, Ardha Nareeswarar and Bhikshadanar idols as the Goshta idols. Chandikeshwara idol is also found as usual in the first prakara. The second prakara has the bas-relief images of Sapta Matas, Ganesha idol and shrine of Shanmukha with his consorts. There are two Goddess shrines in this temple; both are located in the second prakara and both are named as Vishalakshi. The east facing shrine has very tall idol. The other shrine is facing the southern direction. There is also a separate shrine for Viswanathar-Vishalakshi near the tower. Separate bali peetha, flag post and Nandi idols are found in front of Shiva shrine as well as Goddess shrine. The site where Nataraja appeared to Vashist is called as Ratna Sabha which is found inside the main shrine. An ideal place for art lovers as well as for devotees. 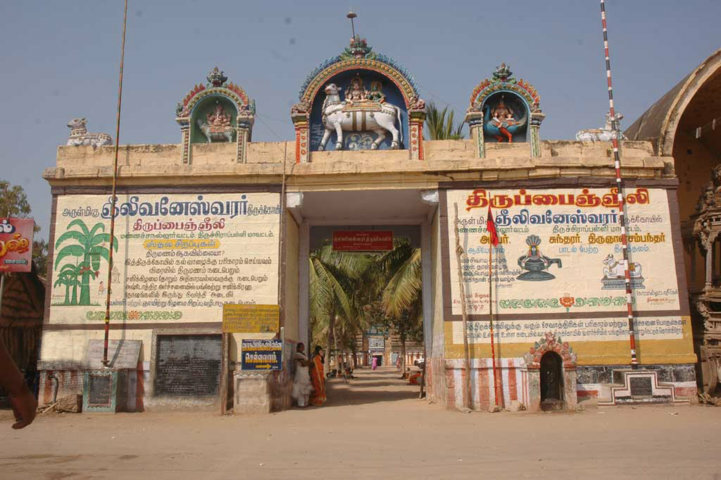 Melai Chidambaram: There is Rathina Sabha in this temple also like Chidambaram. One time, Viyakirapatha munivar and Pathanjali Munivar went to Kailasam to see Shiva’s dance, that time shiva told, go to Chidambaram, there I will give my Nataraja Darshan. As per shiva’s words, they went to Chidambaram, Shiva gave his darshan to them on the day of thaipoosam. By hearing this incident, Vasista Munivar asked Shiva, “When I will see this Darshan in Chidambaram?” Shiva told him, “I will give Nataraja Dharshan to you in Gneelivanamagiya Thirupangneeli”. As per that, Shiva gave Nataraja Dharshan to Vasista Munivar in Rathina Sabha of this temple. 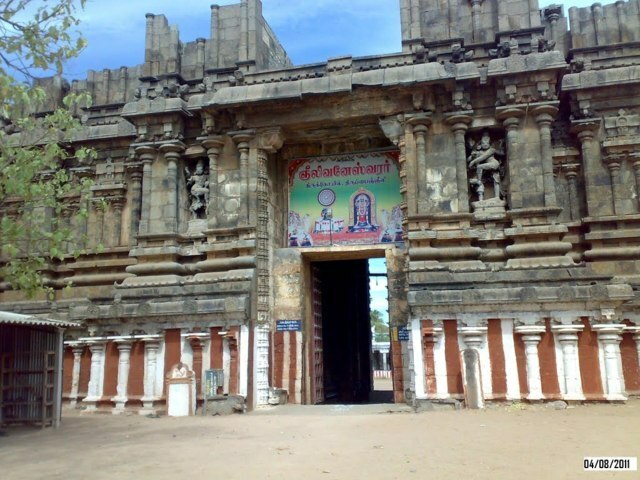 So this temple is also called as Melai Chidambaram..
ThenKailaSam (South Kailash): Vayu Bhaghvan and Adiseshan had a dispute to find out who is superior, to prove the superiority adiseshan encircled the Kailasam, Vayu tried to remove this encircle by creating santamarutham (Twister). Because of the santamarutham, 8 kodumudigal (parts) fell from kailasam into 8 different places which are Thirugonamalai, Thirukalahasti, Thiruchiramalai, Thiruenkoimalai, Rajathagiri, Neerthagiri, Ratnagiri, and Suwethagiri. 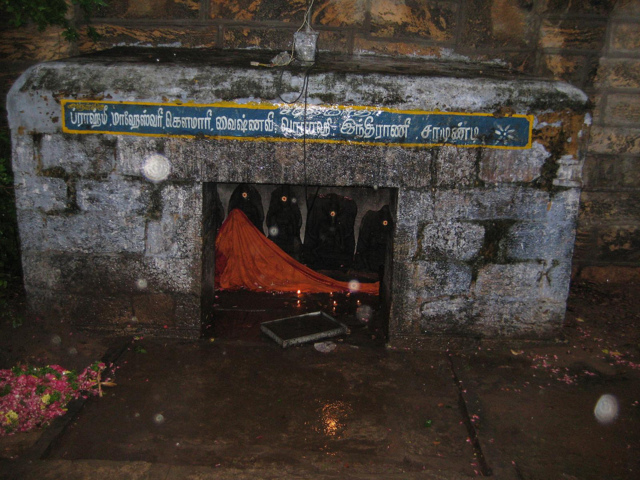 In this Suwethagiri is called as Thirupangeeli. Because this place came from Kailasam, it is called as Thenkailasam in Tamil. Gneelivaneswarar God Shiva in this temple is called as Gneelivaneswarar. Shiva is in the form Suyambu linga (suyambu means it came from earth, it’s not made by anyone). There are many names for Shiva in this temple like Kathali Vasanthar, Gneelivaneswarar, Paramasambu, Aaraniya Vallaver, Eluthariya Peruman. But the famous and well known name is Gneelivaneswarar. There are many who have worshipped in this temple. Mahavishnu, Indiran, Kamadhenu, Adiseshan, Vayu Bhaghvan, Agni Bhaghwan, Rama piran, Arujunan, Vasista, Sudhamamunivar, Sapta Rishis, Musukunda Chola, Kaliyugarama Pandiyan, Viyakirasuran, Sivamithiran, Padumakarpan, Sutharman, Ankamithiran are worshipped in this temple. Rajagopuram: It is not fully constructed. It is constructed by Sundara Panidyan. It is 30 ft gopuram. Dancing statue on both sides looks beautiful. The information about all donated properties to this temple and how much they donated to maintain this temple are given in 2 kalvettukal (epigraphs) in north and south side of this gopuram. 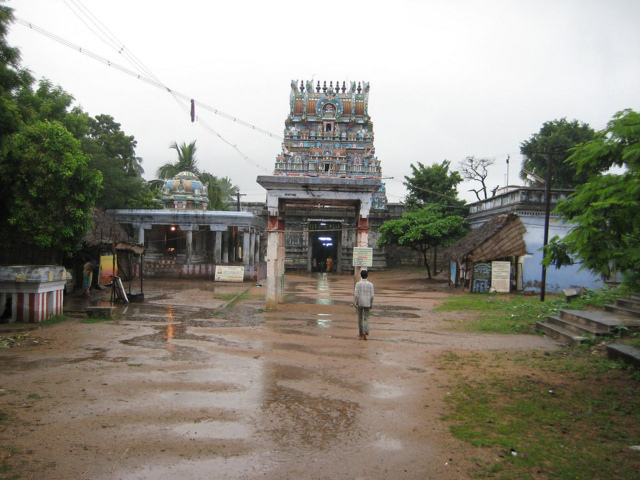 Soothamamunivar Devasamadhi Soothamamunivar did tapas in this temple for many years and he attained Sivakathi (Moksha, Mukthi). This samadhi is in southside, on the way from Rajaokpuram to Second Gopuram. Sorudiya Eswarar Sannidhi: Tappar (Shiva Disciple) visited many Shiva temples and he was coming towards to Thirupangeeli, it was summer season, he felt so much thirsty and hungry, he suffered so much, Shiva came to know about this, so he took a form of andhanar (Brahmin Guy) and came to Appar, asked, “where are you going? “. Appar replied, “I am going to see Thirupangeeli Gneelivaneswarar”. Then andhanar told to Appar, “I am also a devotee of that god and doing poojas there” and I am having kattamudhu (Rice like tamarind rice, lemon rice, pongal), please eat this and I will take you to Thirupangeeli temple. Appar ate that and they both reached the temple. As soon as they reached the temple, andhanar disappeared, and Shiva took his original form and gave darshan with Parvathi in Rishaba Vakana to Appar. So Shiva is called Sorudiya Eswarar (In Tamil soru means annam). As a remembrance of this incident, till now every year Chithirai Month (Tamil month, in English it will come in the month of May), this festival will be celebrated. 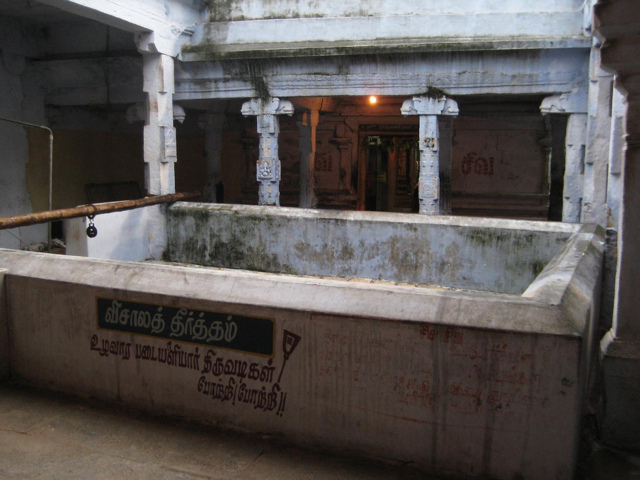 Kasi Viswanathar Sannidhi This Sannidhi is situated without roof in north side from four pillar hall of this temple. It is constructed by Thuraiyur Jamindar. Adikaravallavar Sannidhi To give boon to Markendaya to live forever, Shiva killed Yamadharman in Thirukadaiyur. Since yama died, people started living without death, world became over populated, there was no poojas in temple, all caste people forgot their duties, Bhoomadevi (Bhoodevi) codn’t bear the weight, entire world started suffering. But, Poojas were happening in only Thirupangeeli temple and no issues here. So Mahavishnu, Bramha, Bhoomadevi, and Shiva disciples all came to this temple and worshipped & requested Shiva to give Birth to yama. As per their prayer, Shiva gave rebirth to yama through pilathuvaram on the day of Thaipoosam. Shiva gave power to yama again, so he also called Adikaravallavar. (In Tamil, athikaram means power. 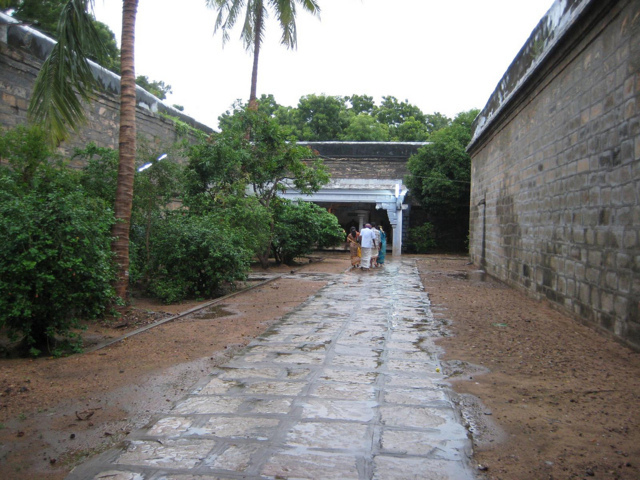 Seven virgins-Saptha Kannikas – Brahmi, Maheswari, Gaumari, Vaishnavi, Varahi, Indrani and Chamundi came to this place before their wedding seeking the darshan of Mother Ambica. Mother appeared before them and said that they would be married with good matches and enjoy a happy life. Mother also granted the boon that they would be in the place in the form of plantain trees enjoying Her darshan. Accordingly, they stayed here. Lord Shiva too graced the place in His Linga form. Location: This temple can be reached from Trichy. Bus facilities are available from the Chatram Bus Stand in Trichy and is about 15 Kms from Trichy. 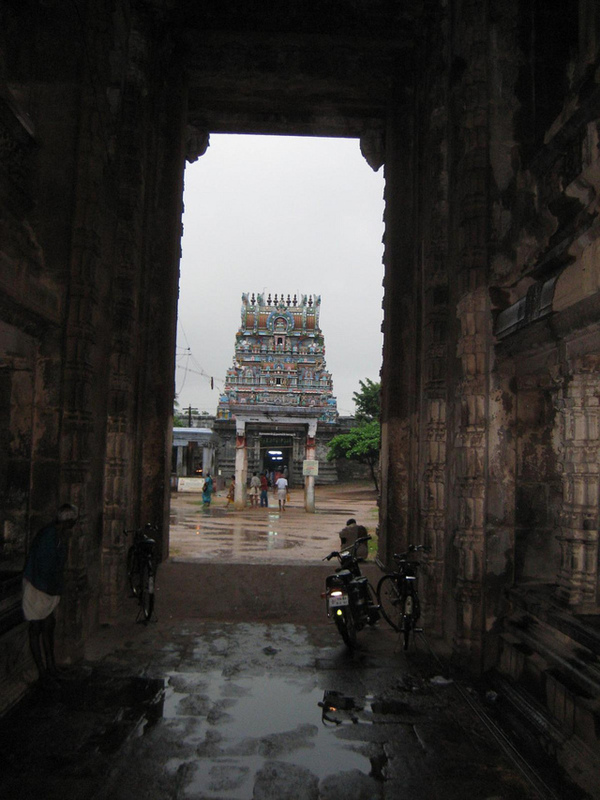 Tiruvellarai, one of the Divyadesam shrines of Lord Vishnu, is located just 4 Kms from here. Phone: +91 431 223 0257.